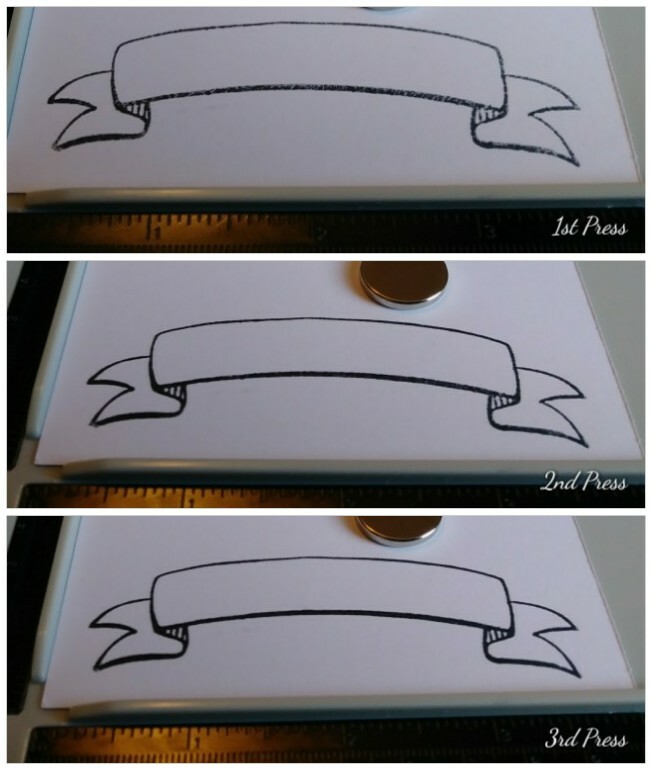 These simple little banners are a great edition for any special occasion. I'm making these with a birthday theme but I think with a little dressing up would be perfect for wedding cupcakes. A great thing about these banners is that you can use up all that scrap paper in your paper stash. Both banners before the edges were inked. Inking the edges will cover the white space. 1. Stamp your image on your scrap paper, Figure 1. This is a new stamp set for me and being the impatient person that I am, I didn't pre-condition my stamps to get a solid image. What I did instead was use my stamp positioner to stamp the image multiple times. With each press the image gets clearer. 2. Color your image. I used for the pink banner I used Artists' Loft Alcohol Markers R3, R6 and R16, Figure 2. I used B1, B4 and B8 for the blue banner, Figure 3. I'm not the best at coloring but the key to mastering a realistic look is going over the colors multiple times with your markers. 3. Heat emboss a sentiment, Figure 4. A name would be perfect. 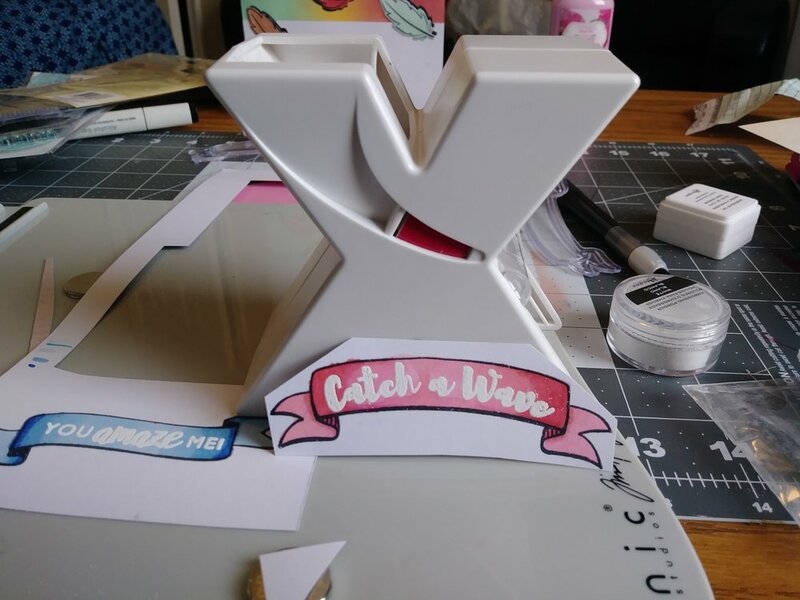 I was thumbing through my stamp collection and saw this "Catch a Wave" sentiment from Sizzix. It was already curved like the pink banner and fit perfectly. The "You Amaze Me!" sentiment came from a Hampton Arts set. 4. Cover up marker bleed through by decorating the back of the banner. The more color you put down on your banner the better so don't be surprised to see that the marker bled through to the back. We'll easily fix this by decorating the back. For the pink banner, I cut it down to fit in my Xyron sticker maker, Figure 5. Pull your banner through the "X". It should come out in a little adhesive pouch, Figure 6. Rub it to ensure that the adhesive sticks to the back. Peel the printed side off and stick it on a scrap piece of cardstock. Finish cutting out the shape of the banner, Figure 7. If you don't have a sticker maker, it's not necessary, in Figure 8 you'll see where I used washi instead. 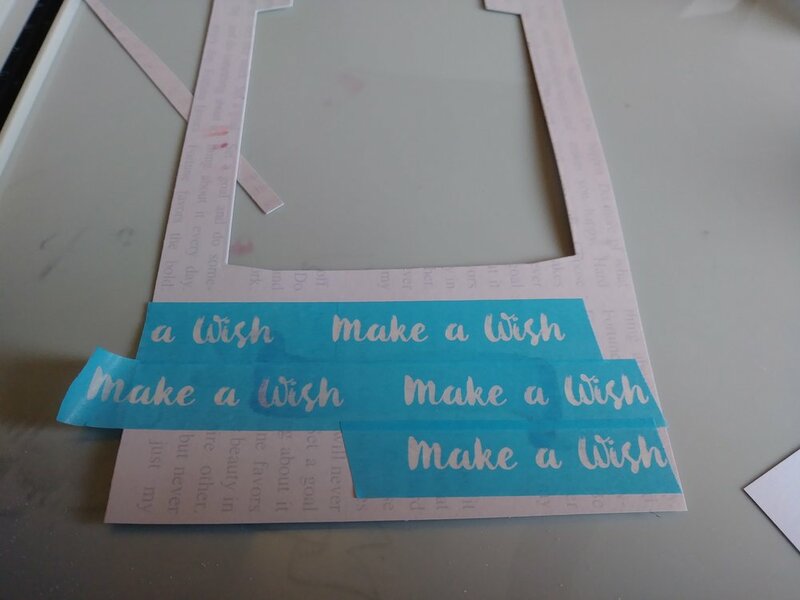 To use the washi method I suggest covering the back of the banner with washi first then cut the banner to save time on cutting. 6. Ink your edges with black ink. This will give a finished look to your project, Figure 9. 7. Glue toothpicks to the back of the banner, Figure 10. Use your creative judgment for this step. You can glue your toothpicks so that the banner is placed halfway through or at the very top. The toothpick will be stuck down in the cupcake to hold the banner. Make sure to use a non-toxic glue or use scotch tape instead. Your banner is complete! If you made this tag me in your photo on Instagram, I'm always interested to see what you may have come up with.